Software Engineers using Enterprise Architect can manually map Use Cases onto Class diagrams, detail the interactions between Classes, define the system deployment with Deployment diagrams and define software Packages with Package diagrams. Within Enterprise Architect you can study the Use Cases developed by the Software Architect, and with that information create Classes that fulfill the objectives defined in the Use Cases. 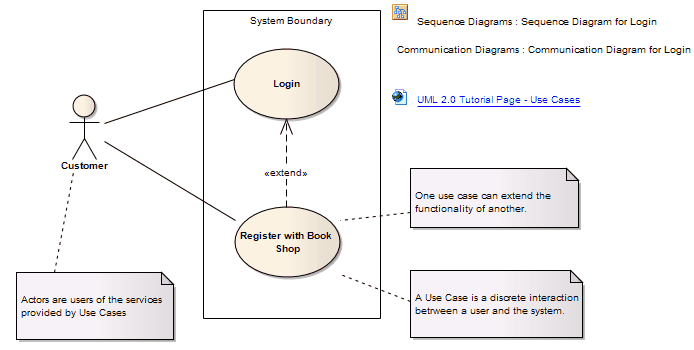 A Class is one of the standard UML constructs that is used to detail the pattern from which objects are produced at run time; to record the relationships between Use Cases and Classes, you can create diagrams linking the elements with Realization connectors, and/or map the Realization connectors in the Relationship Matrix. You can use Interaction diagrams (Sequence and Communication diagrams) to model the dynamic design of the system. Sequence diagrams are used to detail the messages passed between objects, and the lifetimes of the objects. Communication diagrams are similar to Sequence diagrams, but instead display the way in which objects interact with other objects. Deployment diagrams provide a static view of the run-time configuration of processing nodes and the components that run on the nodes. Deployment diagrams can be used to show the connections between hardware, software and any middleware that is used on a system, to explain the connections and relationships of the components. You can use Package diagrams to detail the software architecture. Package diagrams are used to organize diagrams and elements into manageable groups, declaring the dependencies.